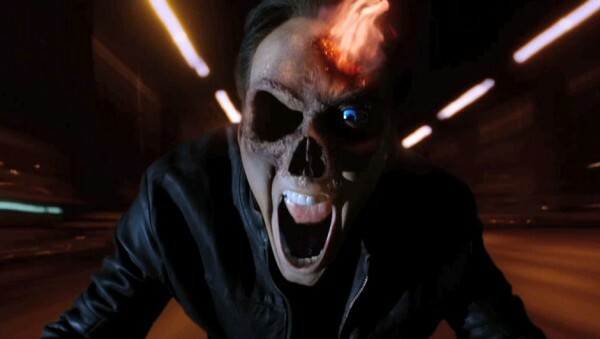 In the annals of Marvel Comics motion picture adaptations, 2007’s Ghost Rider is a sad, misguided footnote barely worth expending the energy to mention. Helmed by Daredevil director Mark Steven Johnson, it was a tediously limp franchise launch that impressively managed to render a tragic flaming biker skeleton boring. No mean feat, that! However, despite toxic word of mouth and a flurry of critical jabs, the lifeless origin tale managed to gross a respectable, if somewhat discouraging, $228-million dollars worldwide. Remarkably quickly, the usual studio sequel chatter withered on the vine, as audience demand for the next chapter was roughly as voluble as the sound of a lone tumbleweed lazily rolling across the barren desert plain. Of course, never underestimate the motivational power of being forced to forfeit the rights to an iconic fanboy property! In an effort to keep the languishing superhero under the studio umbrella, and away from rival Marvel Studios, Sony dusted off a near-decade old script by Blade and Batman Begins scribe David S. Goyer and enlisted deranged directorial duo Mark Neveldine and Brian Taylor of Crank fame to reignite the Rider. The off-kilter end result, Ghost Rider: Spirit of Vengeance, is a crazed hallucination of nonsensical, frenzied idiocy that somehow manages to out-stupid its insipid predecessor while still crossing into shameless guilty pleasure territory. Make no mistake; as a film it’s ten tonnes of terrible. That said, in the interest of full disclosure, I’m compelled to confess that I was occasionally amused by its unrepentant bargain barrel trashiness. Stripping away most of the elements established in the original, Spirit of Vengeance picks up with cursed stunt-artist Johnny Blaze (Nicolas Cage, the sole casting leftover) adrift in strangely desolate Eastern Europe. Nomadic, friendless and plagued mercilessly by the powerful demon raging with him, he’s recruited by a wine-guzzling monk named Moreau (Idris Elba) to help prevent the Devil (Ciarán Hinds) from achieving unimaginable power. His villainous plot centers on a young boy named Danny (Fergus Riordan), whose actual parentage is a secret long kept by his resourceful and tough mom Nadya (Violante Placido). Now hunted by a team of bounty hunters led by vicious pretty-boy killer Ray Carrigan (Johnny Whitworth, who dons a bad rockstar wig after being transformed into the evil Blackout), the family has no one to turn to except the unpredictable and dangerous Blaze, who desperately needs to succeed in his grim task if he ever hopes to regain his long lost humanity. Neveldine/Taylor – as they concisely credit themselves – have never been particularly skilled at storytelling. Their Crank movies, and the spastic, migraine-inducing Gamer, were intentionally obnoxious exercises in chaotic, go-for-broke insanity and guerilla-style filmmaking showiness (the pair are known to shoot their action by whizzing around on rollerblades). 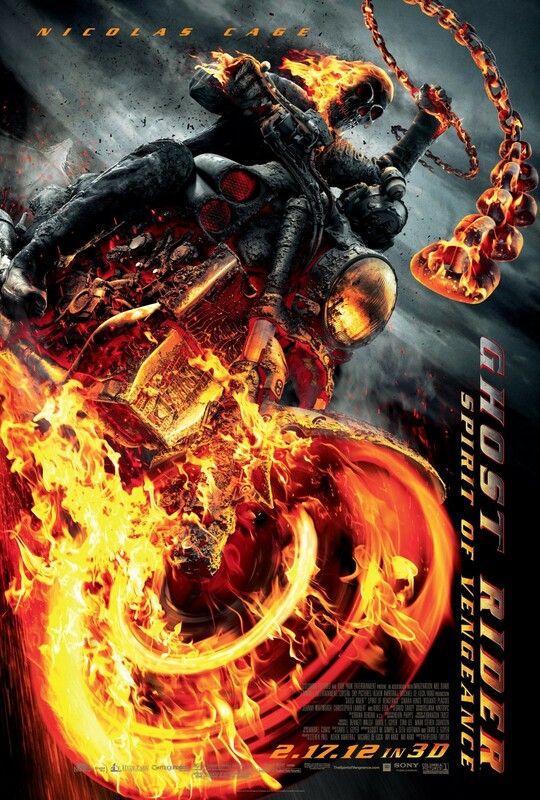 For better or worse, Ghost Rider 2 cheerfully follows their usual manic modus operandi, with cheerfully dopey visuals – slightly more subdued than usual, probably due to the sadly underutilized 3D – propping up a sloppy joke of a script. There is some fun stuff here, amidst the flotsam, such as a massive fiery mining crane smashing enemies into cinders or a scene in which the hero pees fire. Seriously. They do a good job giving presence to their walking matchstick crusader. The Rider is usually silent, doesn’t move around much, and his primary power of staring people to death isn’t overly cinematic, yet he’s a genuinely cool vision in bubbling leather, flame and smoke. And, unlike last time, his oddball abilities, such as spewing back molten bullets, transforming random vehicles into apocalyptic death rides and using his trusty chain to drag baddies to Hell are given a fitfully goofy showcase. As a dynamic on-screen protagonist, he grabs your attention. It’s hard, though, to watch the disjointed Spirit of Vengeance and not notice the significant resemblance it bears to the notorious comic-book box-office disaster Jonah Hex, which Neveldine/Taylor penned and later derided as not being representative of their work. As was the case with that pitiful waste of celluloid, this movie has been edited to utter shreds – a possible sign of studio interference – so that characters pop in out of the story whenever convenient (Christopher Lambert’s abbreviated appearance as a tattooed monk is a true head-scratcher), and there’s no momentum or logic to its feeble Terminator 2-lite chase plot. There’s also a reliance on extended sequences of quirky animated exposition, darkly comedic instances of raising the dead and a climactic final battle that takes place in two realms simultaneously. It often seems as if the duo are trying to right the (infinite) wrongs of the Josh Brolin western with Ghost Rider 2, only to stumble into the same clumsy, obvious filmmaking traps that thwarted Hex director Jimmy Hayward. To his credit, Nicolas Cage refuses to play it safe. 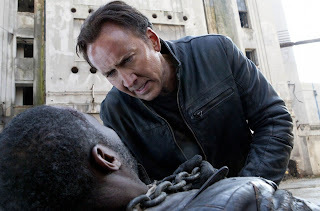 The often fearless actor, who reportedly got into Blaze’s headspace by walking around set in Baron Samedi voodoo god makeup, channels his loony, foaming-at-the-mouth Bad Lieutenant: Port of Call New Orleans protagonist on numerous welcome occasions. In one mesmerizingly bizarre moment he shakes down a black market criminal by giving in to his darker supernatural urges, twitching and sputtering with wild abandon. It’s not a particularly good performance – it feels driven less by character than by a demand to dial up the crazy for crazy’s sake – but he makes his share of the wretched dialogue work, and his idiosyncratic style is greatly appreciated when contrasted against the rest of the largely forgettable cast. Only Hinds is brave enough to try to go toe-to-toe with Cage, delivering a hammy performance that’s operatic in its unabashed ludicrousness. He makes Al Pacino’s scenery-chewing turn in The Devil’s Advocate look restrained by comparison. Fan-adored Thor co-star Elba, boasting a beyond cartoonish accent, is a good sport as the gun-toting warrior monk. Too bad he’s largely wasted in a frankly uninteresting and pointless role. Like the similarly schlocky Marvel sequel Punisher: War Zone, Ghost Rider 2 wears its bad B-movie aspirations on its sleeve, ironically aware of its own pointlessness and bubble-headedly content to revel in hyper-silly violence and cheap empty thrills. No real attempt has been made to add dimension to the tormented antihero and his shallow universe, or spin an engagingly demented yarn worth caring a lick about. Which is kind of unfortunate, because, by Spirit of Vengeance’s end, there’s no mistaking the fact that this Rider’s tank is running perilously close to empty.